I have been experimenting with this recipe for a couple of months now (between various other baking activities) and I think that I have finally cracked the recipe. A few years ago my brother went to the British Virgin Islands and brought back the recipe of one of his favourite cocktails that he sampled at the Soggy Dollar Bar, Jost Van Dyke Island - the "Painkiller". The Painkiller cocktail consists of pineapple juice, orange juice, dark rum, coconut cream with grated nutmeg on the top. My brother and I enjoyed making these cocktails at home. We used coconut cream that is sold in cartons (essentially for making curries) which made them quite indulgent! I wasn't sure whether to decorate these cupcakes with a cocktail stick and fresh fruit, with a cocktail umbrella or perhaps with a straw. 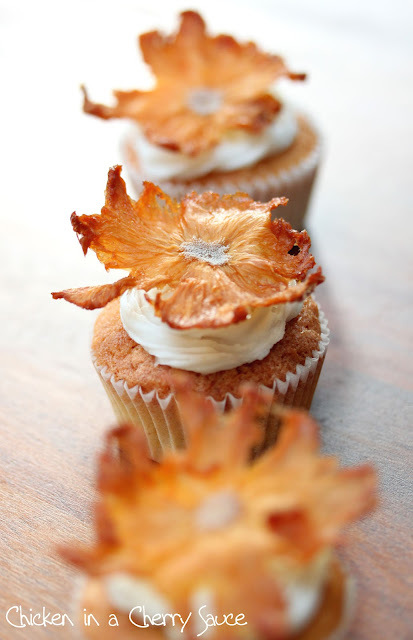 I then remembered reading a post by Maggie from Kitchen Delights on Pineapple Flowers. 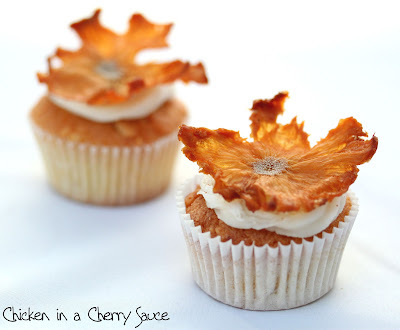 I thought that these were stunning and would be the perfect decoration for my Painkiller cocktail cupcakes, and even more so once I discovered the caramelised and almost rum-like flavours in them. 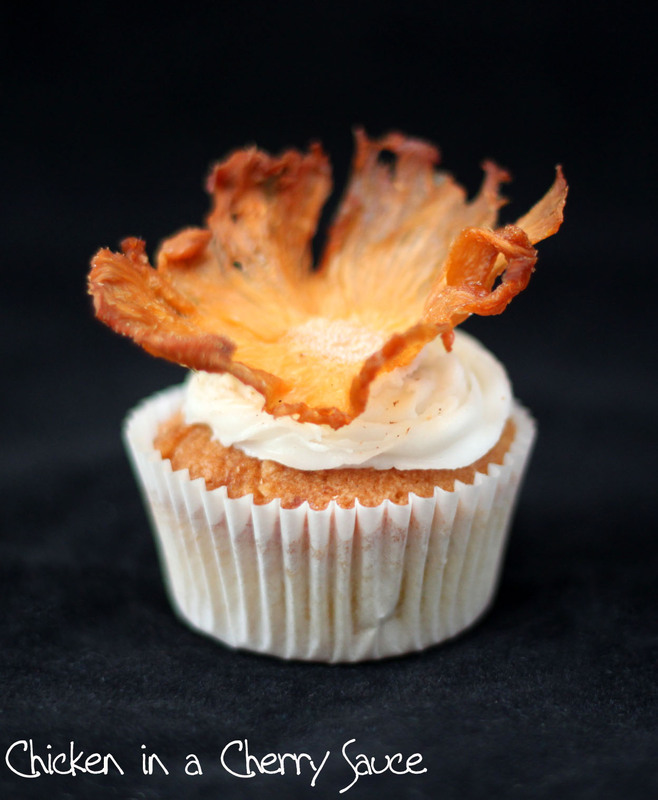 The pineapple flower recipe is adapted from Kitchen Delights and Martha Stewart. This recipe will make 12 cupcakes. Cream the eggs and butter together, then add the rest of the ingredients and mix well. 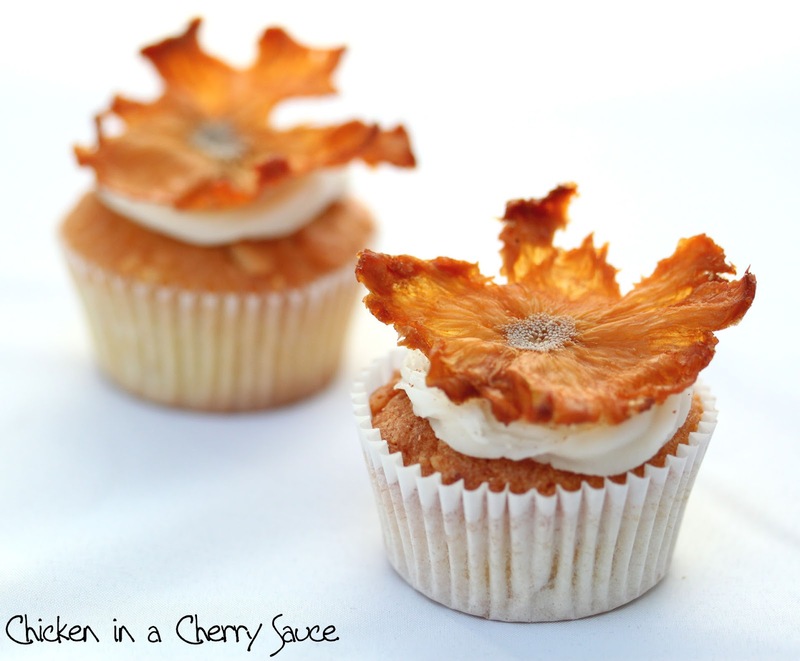 Spoon the mixture into the cupcake cases and bake for 20 minutes at 180°C. Mix the sieved icing sugar, coconut cream and rum together until it forms a smooth and even mixture. Slice the skin off the pineapple and use a melon baller or a knife to cut out the "eyes". Thinly slice the pineapple (as thin as you can without the slices falling apart) and place the slices on a baking tray. Cook at 120°C in a fan oven for 30 minutes, then turn the slices over and cook for 1 hour, or until the slices have completely dried but remain flexible. The cooking time will vary dramatically according to the size of the slices, the ripeness of the pineapple and oven conditions. Place the slices in cupcake cases and allow to set over night in the oven (turned off!) to set the flower shape. Frost the cupcakes with the icing using a piping bag. Add a light grating of nutmeg, place a pineapple flower on top and serve. Initially, I thought that the coconut in the sponge would be enough for the cupcake and I tried to create a rum-infused meringue butter icing. The icing was delicious, however, it was lacking the creaminess of the coconut cream, so I decided that this ingredient had to be part of the icing. I understand that pineapple juice is a key part of the cocktail, but I found it very difficult to incorporate this flavour into the sponge. I tried pineapple juice and I also tried chunks of tinned pineapple, since I struggled to get hold of dried pineapple. Yet, overall, I am happy with the flavours contributed by the pineapple flowers. I used silicone cupcake cases to help the cupcakes hold their shape. I have found, many times, that paper cases tend to spread out during baking and form rather flat cupcakes. Using the silicone cases really helps to keep their shape. The pineapple flowers can be stored for up to 2 weeks in an air tight container. Do not store the cupcakes once they have been decorated because the moisture from the icing will cause the pineapple flowers to wilt. I hope that, one day, I will be able to taste a real Painkiller cocktail from the Soggy Dollar Bar in the British Virgin Islands. However, these cocktail cupcakes will have to suffice for now! The title "Painkiller Cupcakes" really attracted me to this lovely post of yours. The cakes look real pretty and the photography is beautiful! These sound amazing!! I love the flavours. The pineapple flowers are such an awesome touch too. So unique, gourmet, and beautiful! I love the name painkiller cocktail! I'm going to have a go myself. Love the pineapple flowers too which are not too difficult to make but looks amazing. Many years ago I spent some crazy hours at the Soggy Dollar. What a brilliant idea to make cupcakes from the cocktail. This post made me smile today. Lovely to hear that this post made you smile :) I really hope that I get to go to Soggy Dollar myself one day - the Painkiller is such a great cocktail! 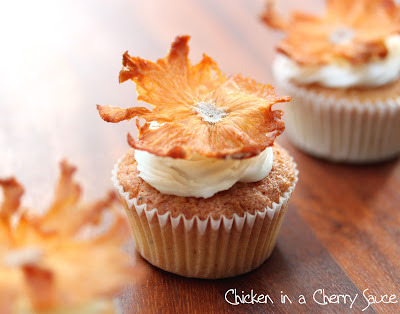 These look excellent - great flavours and that pineapple flower decoration is just perfect. I can't think of a better name for a bar than the Soggy Dollar. I wish I was there now. 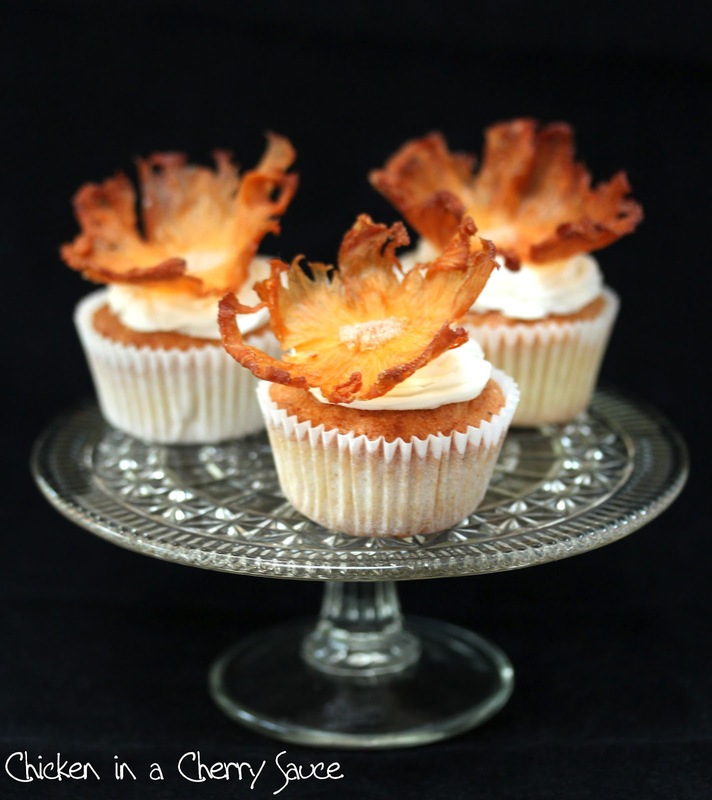 They look beautiful and delicious - I love the pineapple flower. for a moment I thought you actually sneaked painkillers into those cupcakes..cake on crack. haha! this looks yum! the wafer thin pineapple slice is really impressive! These pineapple flowers add not only excellent flavour but they are a conversation piece as well. Thanks for visiting my blog and commenting so that I can find you. Thanks for this blog. it is best one blog. these look excellent and have nice flavour. Thank you so much for visiting! I love hearing from you. An English girl whose life revolves around food!